Crabs run a close second to shrimp in consumer shellfish popularity. Hard-bodied and with ten legs - two of them strong pincers - these interesting creatures range in size from the pea crab to the giant Alaskan king crab. Among the nearly 4,500 species, only a few are commercially sold as food. Blue Crab (Chesapeake) – Smallish variety from the U.S. East Coast. During the molting process, when the crabs have lost their old shells, they are collected as “soft shell” crabs for breading and frying. Dungeness – Abundant during winter along the coast from Alaska to Mexico. By law, only males larger than 6-1/4 inches can be harvested. 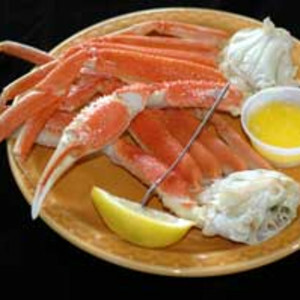 King Crab – Also known as Alaskan, Japanese, and Russian. As the largest species, it can reach 25 pounds. Most meat is collected from the legs and claws. Meat is white with a bright red tinge on edges. Snow Crab (Alaskan/Queen) – An Alaskan coastal species, but smaller than the King. Stone Crab – Claws contain superior-tasting meat. Only one claw is removed during harvesting and the crab is returned to the water to regenerate a new pincer. Harvested in Florida from October-May. Imitation crab is made of minced fish (usually whiting or pollock) plus preservatives and other additives (known as surimi). When buying live crab, make sure it has been in the store’s display tank for no longer than a week. Select those that are most active. Crab is packaged in several ways. Canned (and unpasteurized) products are usually located with tuna. Pasteurized crab, along with cooked and stuffed varieties, will be in the refrigerated section near the seafood counter. Meat is packaged as lump (large/colossal/jumbo chunks), backfin (smaller pieces), claw meat, or in varying combinations of these three. Fresh crab should the purchased the same day it is to be prepared. Live crab can be refrigerated in cold water no longer than twelve hours. Pasteurized crabmeat can be refrigerated in its unopened package for about six months. Canned crab can be kept for at least a year unopened. After opening, refrigerate in an airtight container and use within two days. All crab meat spoils quickly, even after cooking. Never leave it at room temperature for any length of time. Crab can be frozen (alive or otherwise) for about three months. Do not refreeze.